I have written hundreds of these essays and articles. This is a first for me. Isn’t that intriguing? I’d love to get onto that highway! I am publishing it because I’m positive his article will be excitingly provocative to people of open mind and liberal views. And my hunch is that you are one of these. I don’t call him Dr. Jain. I call him by his first name, Sulekh. He has been my close friend for 43 years. In fact he calls me Brother John. Yes, Brother John. That is part of his Jainism. What’s that? Jainism is a very old religion, an elder cousin of Buddhism but different. Definitely much older than Christianity. Most Jains live in India. His family name is Jain. I’m sure you’ve noticed that. But some Jains do not carry the name Jain. faceted in so many ways. I doubt you’ve ever met anyone who comes close. Yes, he was born in Indi, in 1937. He went to university and studied engineering. Long ago he told me that the best students in India in those days became engineers. Those who couldn’t get into the engineering program became medical doctors. How about that? Another interesting detail is that from high school on, his schooling was in English. Not in Hindi, which is the most widespread of India’s many languages, and which is the one Jains speak. In English because for Science, Math, Engineering, Technicity (that was the right word over there) and Medicine, English has been widely used in India. He was a top student and was most fortunate, he says, to get a scholarship to study for a Ph.D. in Mechanical Engineering in England at the University of Birmingham. You’re probably familiar with how England ruled India for many decades. Well, the relationship between the two was still strong. That ended when the great Mahatma Gandhi gained India’s independence through peaceful determination. Without firing a single bullet! He was opposed to that. That momentous event took place in 1947. Sulekh and Ravi married in 1961. Interestingly, that was a marriage arranged by his father and hers. “We believe love will come!” Sulekh explained when he saw my eyes open wide when he told me that long ago. They also had two children, their son Anudeep and daughter Vandana. In 1966 they flew off to strange England together. He was 29. Not only strange. So different in many ways, a leading one the climate. Very nasty compared to the balmy temperatures of their upbringing. The culture shock was exactly that. Very shocking. He wasn’t deterred. He got his Ph.D. in 1969. In less than three years. Then a good fluke. Right then, through a connection he was accepted to the University of California at Berkeley for a Post-Doc! That exclamation point is justified. He was 32. Finally, after all those years of studying, he got his first professional job. That was as a research engineer clear across the country — at the Wyman-Gordon Co. in Worcester, Mass. He and Ravi and their two kids settled in there. In its business, Wyman-Gordon is famous around the world. Its specialty is forging (shaping) metals, especially aerospace metals. It had 5,000 employees back then. Sulekh was in his element. He rose through the ranks. He was there 12 years. At the end, he was a senior research engineer and the head of a staff of several engineers and support staff. He believes he was the only Indian in the whole of Wyman-Gordon back then. He and Ravi and the kids became US citizens in 1975. They were delighted to be here to stay. During that time, by the way, on the side, he studied business administration at Clark University there in Worcester, earning a master’s degree.. Early in his arrival in the U.S. he became active in Jain affairs. At that time, there were hardly 5,000 Jains in the whole of the U.S. and Canada. Sulekh became a leader. I met Sulekh in 1976 – 43 years ago. I had been the magazine editor at the Worcester Telegram and Gazette. We had become close friends. That’s a long story, too, and I’ll beg off till another time. He had been telling me that one day he would take me to India. I’d just laugh. Impossible! Well, in 1989, one day he called from Cincinnati. At that time he was a senior staff engineer there at General Electric Aircraft Engine Division. Wowed me. Told me we’d be flying to Delhi, India’s capital, in December. Had made a reservation for me. That’s the most comfortable time there weather-wise. We’d be there seven weeks. I felt I had misunderstood. He had to repeat the whole thing. Wow! But I was going to say no. We’d be there Christmas and New Year’s, key family holidays. Seven weeks in such a strange place! It’s my daughter Monique who talked me into going. I’m enormously grateful to her. By this time, Sulekh was the president of all the Jains here (about 40,000) of a central organization called The Federation of Jain Associations in North America (JAINA). Sulekh was going to India to meet leading Jains, give a report about Jains here, explain life here, and tighten the relationship. He was going with his wife Ravi. Their two children had started in medical school in Houston. Must tell you Jains are a tiny minority over there in their native country. Less than one percent of the population of India. But Jains have always played a leading and prominent role in the affairs of the country. We roamed through a great area of India, north, south, east and west. Mostly we were driven by a hired chauffeur, five of us crowded in his little sedan, often on narrow and bumpy roads. Once we took a plane to save time. We’d be two days in this city. Three days in that. In each Sulekh would give a talk the leading l Jains. Always men, by the way. Sometimes there would be a hundred plus. Sometimes just 50. It was all in Hindi. I didn’t understand a thing. But he’d mention a key word, such as Wyman-Gordon, or the Worcester Sunday Telegram, so I knew what he was talking about. By the way, they’d al be sitting cross-legged on the floor. That’s the Indian way. Impossible for me. Somehow they’d manage to find a chair for me. Oh, Jains have always been vegetarians. Very important for you to know that. It’s because they believe in ahimsa, absolute non-violence. Hurt, harm or kill no person, no creature of any kind, big or small, not even a mouse or an ant. I was a meat eater. But it’s by living with vegetarians day after day, and having to eat like them, that I became interested in vegetarianism. So I have been a vegetarian for years now. I mentioned how Sulekh and his family experienced culture shock in England. Ditto when the moved to the U.S. Well, I experienced it in India. You would, too. But it was educational, to say the least. In vegetarianism Sulekh has topped me. He and his family are now vegans. That’s super vegetarianism. The selection of foods is much more limited. No milk products, for instance. No eggs. But no problem, says he. I spoke of the high role of Jains in Indian society. Well, I got to meet a justice of the Supreme Court of India because he was a Jain. I got to meet the editor of the Times of India, the most important daily newspaper with the largest circulation, because he was a Jain, and so on. Of course, we visited the famous Red Fort in Delhi. And the Taj Mahal. The monument to Mahatma Gandhi. And many famous Jain historic spot including a dozen Jain temples, magnificent edifices, unbelievingly beautiful, often centuries old. The Jains have countless such temples, including striking new ones. Of course, we saw the sacred cows roaming the public streets. Saw full-grown elephants being walked through cosmopolitan downtowns. Saw snake charmers playing their flutes and getting their cobras to rise from their baskets and shift back and forth, their fangs exposed. This was old stuff to Sulekh and Ravi but so exciting to me. We visited the country’s most important university where Sulekh knew a professor, a Jain of course. We traveled to the city of Bangalore, which even then was emerging as the capital of the growing digital industry. And met a scientist there, again a Jain. On and on. A fabulous trip. When we returned, I wrote several articles about it. One was for the leading Jain newspaper in the United States, a report as a non-Jain describing his experiences in India. By the way. Sulekh told me we saw more of India than most of the Jains who had moved to America. Sulekh told me he had heard that good comments about my account. Well, it so happened that I returned to India a few years later, during my solo Around the World tour. Traveled across the whole wide country, from Madras and Calcutta on the eastern side to Bombay, now called Kolkata, on the western side. By train. Yes, alone. A huge adventure. Had occasion to meet Jains I had made friends with while with Sulekh. Our friendship has continued these many years. I have visited him in different parts of the U.S. as he moved from job to job. Became very close to the whole family. For instance, had the pleasure of attending the three-day wedding of his son Anudeep in Houston in 1988. Yes, three days. If anything, Sulekh’s interest in Jainism has intensified. It has become a passion, and that’s what he himself calls it. Now 82, he is retired, but he devotes his days to Jainism here, involving himself in a wide variety of Jain activities. Once hardly 5,ooo, as I mentioned, the Jains now number some 140,000 in the U.S. and Canada. Of course, many are second and third generation now. It’s remarkable how highly educated and successful they are as a whole. Among other things, he has raised funds from wealthy American Jains to fund chairs, professorships and post-docs in Jainism at 16 American universities. They include the Universities of California at Davis, Santa Barbara, Irvine, and Riverside; and at Loyola Mary Mount University and Cal State University at Northridge, and Rice University in Houston. In 2005, he developed an annual program to send university faculty and graduate students to India, to learn about Jainism and immerse themselves in Jain life. And now high school teachers also. All made possible by dollar grants to cover nearly the whole bill. To date more than 750 men and women have had the experience. A number have published books and papers. Jainism is becoming better known. More than once I’ve told Sulekh there will be a statue to him here. He has scoffed. It will happen. I am convinced. It is a remarkable book. He cites instance after instance of how some Jains observe ahimsa in fine ways. By the way, that’s a word you must know. “Ahimsa” means non-violence. It’s just the opposite of “himsa,” which means violence. Sadly, here and in India, many profess to be Jains because they are vegetarians but live their lives by doing just the contrary– cheating in all kinds of outlandish ways out of pure greed. Sulekh provides documented instances of acts of himsa. An incredible variety.Things that he has witnessed here and in India. I read his book because I felt I had to out of friendship. I felt it would be abstract. Too philosophical. In fact, dull. Was I wrong! I found it hard to put down. And said that in a detailed review of it. I also felt some Jains must be very angry with him for writing this expose. I still do. If so, it hasn’t crimped his effort. Now here’s a wonderful thing. He makes a free digital copy of his book available at www.isjs.in. Do download it. You won’t be sorry. I’ll bet that like me you’ll stay up late reading about these incredibly scandalous goings-on. Sulekh and Ravi now live in Henderson, a suburb of Las Vegas, largely because of its pleasant year-round climate. Their son and daughter are now eminently successful medical doctors, Anudeep as a radiologist and Vandana as a radiation oncologist. I’ve known them since they were teen-agers. I would be remiss if I did not mention the powerful influence of Jainism on our American culture. Here is how it happened. First, as I explained, Mahatma Gandhi was so influenced by Jainism’s ahimsa that it led him by peaceful means to overthrow British authoritarianism in India and to India’s total independence . Then, Martin Luther King learned about this core Jain belief as practiced by Gandhi while studying for his doctorate at Boston University, and we know the dramatic wonders that his courageous preaching resulted in. Sorry that this ‘introduction of Sulekh” has become so lengthy, but I simply had to give you all this detail about him. So now, do read his remarkable story about a very real highway the likes of which you’ve never heard. Editorial Note: Sulekh supplied a number of fascinating photos. Alas, technical difficulties forced a limit of just two, but they’re beauties. They give an idea of the marvels to be seen on The Highway to Heaven. Three years ago, on an invitation, my wife Ravi nd I went to Vancouver, B.C., Canada, to participate in a three-day consecration ceremony of a new Jain temple there. One day one of our friends took us to an officially named “Highway to Heaven.” It is a very wide and long street in Richmond; one of the main suburbs of Vancouver. This street is home to more than a dozen very large, ornate, beautiful and palatial places of worship representing all the major religions of the world; all co-existing in harmony and peace. For me and Ravi it was a very eye and mind-opening tour. In a world of headlines making us cringe from accounts of ideological extremism exalting the name of God through terror, there is another story of quiet religious harmony that exists right here in this backyard of one of Canada’s largest cities. Richmond’s straight-and-narrow No. 5 Road, which runs through the agricultural lowlands of British Columbia’s Lower Mainland, has become the auspicious conclave of a thriving multi-faith community. Richmond, an “ethno burg” of Vancouver, is a city of some 207,500 people. It is also home to more than 60 mosques, temples, churches and religious schools of all denominations. No wonder No. 5 Road has adopted the name “Highway to Heaven” with its many religious sites. The city’s large multicultural population is reflected here, through the diversity of exotic temples and places of worship which all encourage a peaceful coexistence. Visitors will be fascinated by the cultures, history and architecture that mark the colorful houses of worship. Visitors are welcome to share in the spiritual grace and to experience the compassion and beauty found within each of these faiths. Some of these houses of worship are big, spectacular and architecturally unique monuments. Many welcome visitors with open arms whether devout or not. It’s a true story of cultural community woven together out of the best values each faith represents. Yes, the Highway to Heaven’s religious diversity is the result of a City Council rezoning initiative in 1990. Each place is colorful, rich and mesmerizing. One will feel like being culturally immersed into a unique chapter of Richmond’s myriad community. 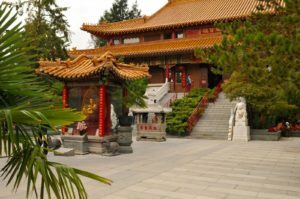 Thrangu Monastery opened its doors in 2010 when it became the sole traditional Buddhist monastery in the Pacific Northwest. With over 600 members and 20 monks, Thrangu attracts students and intrigued visitors from all over Europe and North America. Upon entering, you are welcomed by a breathtaking 12-foot-tall, gold-leaded Shakuamuni Buddha. Vegetarian meals are often served after the religious services and visitors are invited to join in. Also on our Highway to Heaven, one will find the palatial style Ling Yen Mountain temple, home to two worship halls and more than 40 monks. Although smaller, the Subramaniya Swamy temple is one of a few places in Richmond that follows the Hindu religion. Here, holy rites include cleansing effigies in rose water and it is believed that prayers are answered instantly. Visitors are invited to join in every Friday for Karthikeya Pooja; worship and recognition of spiritual growth. Continuing the spiritual journey down the Highway to Heaven is the Hindu Ram Krishna Mandir, in the Vedic Cultural Centre. As in emblematic Hindu culture, visitors will stride amongst many gods and goddesses adorned in traditional embroidered costumes and garlands. Sunday morning Hindu worships include lighting of oil lamps, chanting mantras and a sit-down vegetarian meal after the ceremony. The Vedic Cultural Centre invites the visitors to join in the offered meditation classes, recitals, ceremonies and festivals, all year round. At the Nanaksar Gurdwara Gursikh Temple, a visitor can tour the Sikhtemple and be treated to free lunch. An all- volunteer full-staffed kitchen continues the Sikh tradition started 550 years ago by the first Guru Nanak of administering to the hungry. There’s always tasty vegetarian comfort food served with a smile and graciousness. 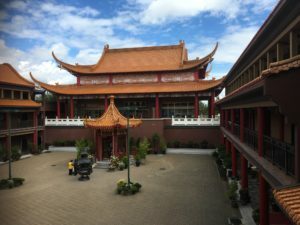 Ling Yen Mountain Temple allows the visitors to stroll through its tranquil and beautiful traditional Chinese gardens of the International Buddhist Society compound. These are spectacular and a must-see. A lot of attention has been focused on the Highway to Heaven. Do these diverse cultures really interact with one another or is it just good press? Like neighbors everywhere, it took time to get to know each other. Language barriers initially made connections challenging but real bonds have been formed. Last year, the Highway to Heaven Association — made up of an interfaith council comprised of 20 different religious organizations — created and debuted a 42-foot float in the Steveston Salmon Festival Parade celebrating Canada Day. Educational initiates have sprouted from this unique medley of theological communities. Students from the Jewish Day School and the Az-Zahraa Islamic School exchange visits to learn about each other’s faith and have joined together to work on a community program for homelessness. Need inspiration from negative news overload? Get into the car and become uplifted through a visit to Richmond’s vibrant multi-faith communities. They are waiting to welcome you into their homes of worship and they are very conveniently located near to each other. Take a day out of your routine and join in services, stop for lunch or a book a guided tour, walk through exquisite gardens and get a personal insight to the major religions of the world in tiny Richmond. Similar efforts are underway in Houston, Texas. On one major street called Synott Road (I call it Sin-Not Road) is home to more than 15 places of worship (Hindu, Jains, Buddhist, Christians, Muslims and more) and still more are coming or being planned. They all live and support each other and in fact share each other’s parking lots too. Recently on a visit to Houston, I urged some of the main leaders there to petition the City to change the name from Synottt Road to The Highway to Heaven. Let us build such Highways to Heaven in all cities and towns in the Unites States of America, Yes, it sounds like an impossible dream. But if Richmond can do it, other communities can!